← I am my history. I can be very salty — you know in that sassy kind of way. Yet, I also have a sweet side. Maybe that is why I am so into things salty and sweet. Take brunch for example, while we do not do it often, there are times when I want to order a sweet dish like french toast or pancakes, and pair it with an egg dish and then split it with Chris. Then I want it on the same plate and so a little bit of the syrup oozes into the eggs and bacon. Why not, right? 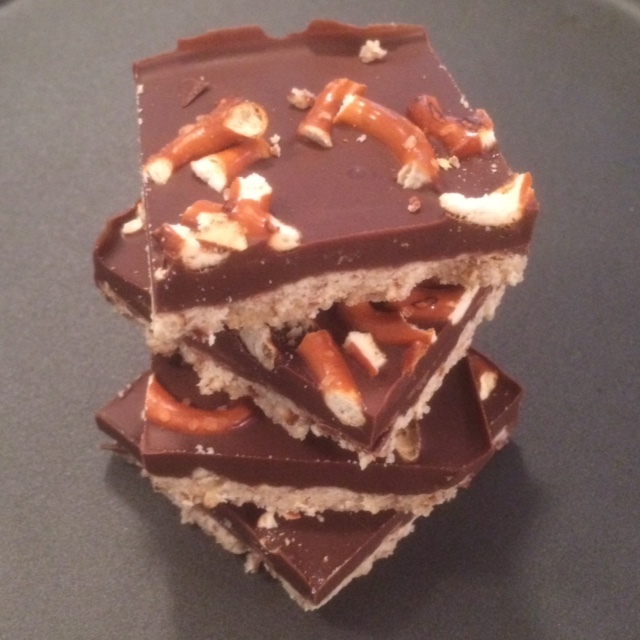 Recently we found this easy peasy recipe for Chocolate Peanut Butter Pretzel Squares. All good salty and sweet things combined. A nice treat or snack that hits the spot. 1) Preheat the oven to 350°F. Line a 9″ x 13″ baking pan with parchment paper. Use enough paper to line the sides for removing later. 2) To make the crust, combine the flour, ground pretzels, and sugar. Mix with your hands. Add the melted butter and mix again until you have a dough. 3) Press the dough into the pan and bake for 12 minutes. 4) To make the filling, melt the chocolate chips in a double broiler. Stir in the creamy peanut butter until completely mixed. Pour the filling over the crust. 5) Sprinkle chopped pretzels on top. 6) Cool in the freezer for about an hour. Remove from the pan by lifting the parchment paper. Slice into your preferred size. Serve cold for best result.